Event: Genetic Genealogy Ireland 2019 (Dublin) – a series of DNA Lectures, held in conjunction with Back to Our Past, Ireland’s annual national genealogical exhibition. Admission Fee: FREE but please register your interest in advance at the Back to Our Past website. This gives you access to EVERYTHING including the DNA Lectures. No other genealogical exhibition offers you so much for so little. The only real costs involved are getting there and staying there. ISOGG Day Out: 20th October 2019 (Sunday) - a special day out just for ISOGG members, speakers and volunteers at the FTDNA stand. Organised especially by Gerard Corcoran, this day out never fails to disappoint! The RDS (Royal Dublin Society) is Ireland's premier exhibition venue. Founded in 1731, the RDS hosts the famous Dublin Horse Show each year and its Exhibition Centre is equivalent to London's Olympia or Birmingham's National Exhibition Centre (where Who Do You Think You Are? Live is hosted each year). It is surrounded by parks, restaurants and affordable accommodation, from Bed & Breakfasts to reasonably-priced hotels. The venue is 15 minutes from Dublin's historic city centre, 5 minutes from Lansdowne Road Football Stadium, and is easily accessible by public transport (both bus and DART). Click here for a link to the RDS on Google Maps. The first Back to Our Past event took place back in 2010. It is run in association with the Active Over-50’s Show and the Coin & Stamp Fair. 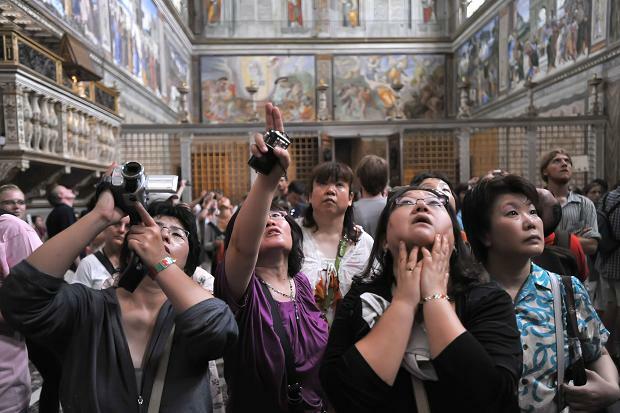 Attendance was 18,000 people in 2014. 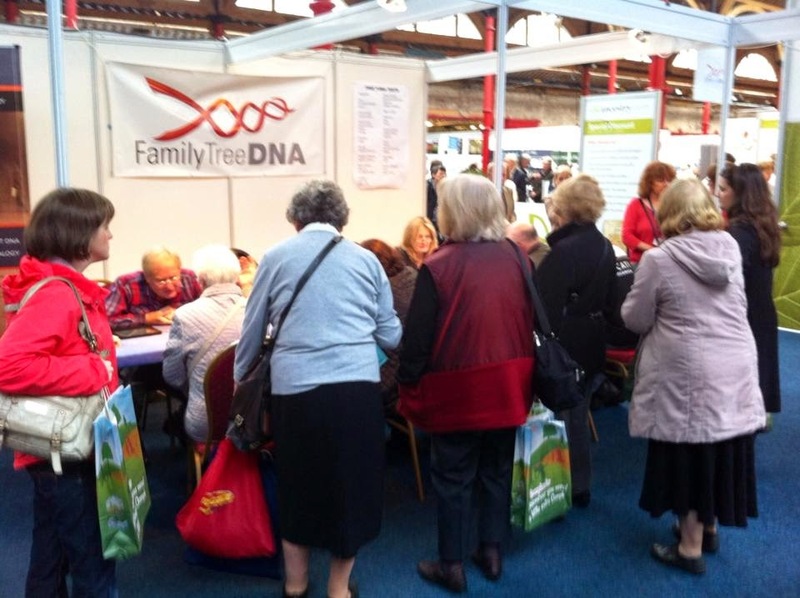 The exhibition consists of a multitude of stands/booths publicising the activities of organisations and businesses associated with genealogy and family tree research in Ireland and internationally. The BTOP website is here - Back to Our Past. There is also a series of lectures, dealing with both traditional genealogy and genetic genealogy. Each year's lecture schedule will be posted here ... traditional genealogical programme and the DNA Lectures. The DNA lecture schedule from previous years can be viewed here ... GGI2019 (Belfast), GGI2018 (Dublin), GGI2018 (Belfast), GGI2017, GGI2016, GGI2015, GGI2014, and GGI2013. 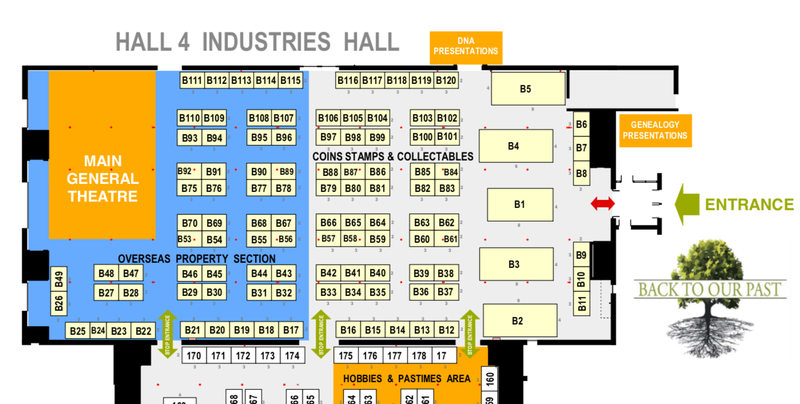 The Back to Our Past section of the exhibition is in the Industries Hall (Hall 4), with the FTDNA (stands B101 & B102) right beside the entrance / exit to the stairs to the DNA Lecture Theatre (see diagram below). A variety of Bed & Breakfast and hotel accomodation is close by. Click the links below to explore further. In previous years, several US colleagues stayed in the Glenogra Bed & Breakfast which is a 4 minute walk to the venue. Two deluxe hotels are almost opposite the Glenogra, namely the InterContinental Hotel (formerly the Four Seasons Hotel) and the Clayton Hotel (formerly Bewley's Hotel). The more reasonably priced Sandymount Hotel (formerly the Mount Herbert Hotel) is also quite close. Hello. I am from the FAROE ISLANDS (the Danish Kingdom) . My Father are Ancient Irish R1b-M222 and my Subtype R1b-S660 . Mother are of the Decorated Pottary People , north Italy (Alps) north too Schleswig-Holstein in Germany , J2a and my Subtype , J2a2c. Other : 0.4 Per cent Royal Stewart from London perferably . I have a dokument from the HOUSE OF THE LORDS in London mentioned online at British History. But sorry I cannot come too yours Meeting Hall at that addresses , it´s too expensive for my . Maybe better another time. Sincerely : Mr. Magnus Torstein Jogvanson Johansen - Gardsvegur 21B , FO 000380 Sørvagur the FAROE ISLANDS. New Mobile No: +298 287754 Faroese Telephone Number at The Faroe Islands TeleCome in Torshavn .